The Legend of Zelda: A Link Between Worlds for the Nintendo 3DS is a direct sequel to 1991’s A Link to the Past and marks a return to the beloved top-down style that so many fell in love with in Zelda’s formative years. While the game shares the same Hyrule as its predecessor, and even an eerily familiar Dark World, now known as Lorule, Link’s latest adventure is still able to maintain its own identity despite the incessant nostalgia present and is able to distinguish itself as one of the most unique Zelda titles to date. A Link Between Worlds introduces a few new elements to the Zelda series that change the conventions of the series. 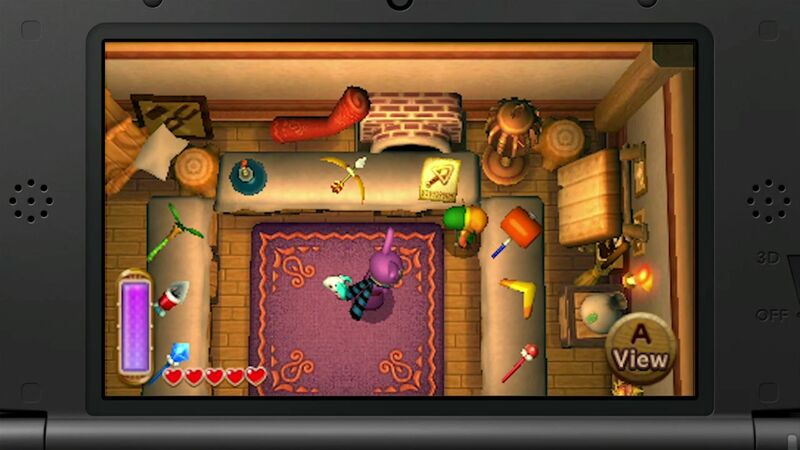 In the game items are no longer found in dungeons, but rather rented from a shop run by the mysterious Ravio. As the game opens up a little, items will then be available for purchase, albeit for a steep price. This allows the player to have all the items available from the outset of the game along with the ability for the player to explore the game’s world to their heart’s content. The catch is once you die, all the items you rented from Ravio’s shop will be returned to him and you will need to re-rent the items. This adds an element of strategy to the game: what should I rent? What should I buy? Items can also be upgraded throughout the course of the game, adding further strategy to what you should buy and what you should rent. Thankfully, rupees are in abundance in the game and it isn’t too difficult to simply rent the items you lost again and be on your way. In the middle of a dungeon though, things can get tricky and this makes death out to be both a grim reality and a scary prospect. It makes death relevant again with consequences. Having all the items heavily available from the outset is a huge risk on the developer’s part and completely changes the Zelda formula, but it works. This game has a heavy emphasis on exploration, unlike the most recent Zelda games, and allows the player freedom to explore in a way that they haven’t been able to since A Link to the Past. 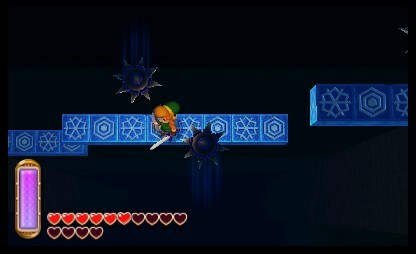 The most interesting mechanic introduced in A Link Between Worlds is Link’s ability to transform into a painting, enabling him to merge with walls. Unlike playing an ocarina or commanding a baton, this brand new gameplay component forces the gamer to look at the world from a completely new perspective and opens the door for some of the most wonderful puzzles that have ever graced the series. 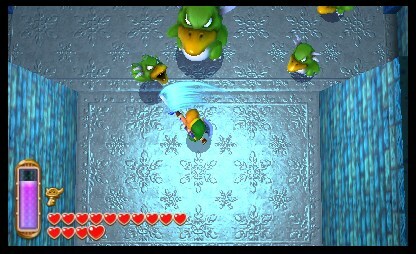 Throughout the game Link is tasked with collecting 100 maimias that have escaped from their mother, as well as collecting numerous heart pieces scattered across Hyrule. This creates the opportunity for some very clever puzzles, some of which still have me stumped. The dungeon design in A Link Between Worlds is superb, and includes some of the best dungeons and bosses that Link has ever faced. The dungeon map is no longer found as an item; rather, the layout is given to you as soon as you walk in the front door. While some may think this will dumb down the experience, trust me: it doesn’t. The dungeons are no more or less difficult because of it. The first three dungeons in the game are fairly straightforward, but once things open up a bit in Lorule, Link faces some of the most treacherous dungeons he has ever encountered. If anything, A Link Between Worlds is very much a thinking man’s Zelda, with much of the emphasis being on puzzle solving, fully utilizing Link’s new ability to merge with walls. The dungeon design is very non-linear and reminiscent of the older 2D Zelda games. I was stumped a number of times over the course of my playthrough, and there is one puzzle that actually had me stuck for hours on end. Yet that feeling of satisfaction once I figured the puzzle out is something I have not felt in a Zelda game since Ocarina of Time. The fact that the game gives the player the freedom to tackle Lorule’s dungeons in any order allows each player to have a different playing experience and enhances the game’s replay value. The order you decide to play through the dungeons will also determine how difficult the game will end up being for you. The Hero Mode in A Link Between Worlds is the most difficult Hero Mode in the series to date and will add a strategic element to the game, forcing you to consider which dungeons to undertake first, as this will be paramount to your survival. A Link Between Worlds runs at a stunning 60 frames per second and is the smoothest looking Nintendo 3DS game on the market. What’s more is that this is a game that begs to be played in 3D. It offers a depth of field and such depth perception that nothing else will truly do the game justice. The dungeons emphasize their vertical nature and if you play in 2D, there are things you could easily miss. I played through the same parts in both 2D and 3D and while some things were obvious in 3D mode, it was more difficult to notice with the 3D slider turned off. No other game has managed to do what Nintendo has done with stereoscopic 3D in A Link Between Worlds and the end result is near perfection. While the graphics themselves aren’t perfect, they fit the top-down style perfectly, even during cutscene presentations. A Link to the Past’s Hyrule is adapted wonderfully and has never looked better. The game’s music is some of the best that has ever graced the franchise. Ryo Nagamatsu, taking the helm for Koji Kondo, was tasked with not only coming up with re-arrangements from Konjo’s A Link to the Past score, but composing original music as well. He does not disappoint. The dungeon music in A Link Between Worlds is perhaps some of the best the franchise has ever had, with each Lorule dungeon receiving its own melody. The score is definitely “video game music of the year” material, in most part due to the new pieces composed and not the old. The only downside to the game is its story. While it has its similarities to A Link to the Past, the mythology and presentation isn’t nearly as good as its predecessor’s. Yuga is a very forgettable villain. The atmosphere and epic nature of Link’s quest is also not up to par with A Link to the Past and many of his previous adventures. The NPCs are rather forgettable as well and I never felt I had formed a serious bond with any of them (aside from Ravio), which was a disappointment. 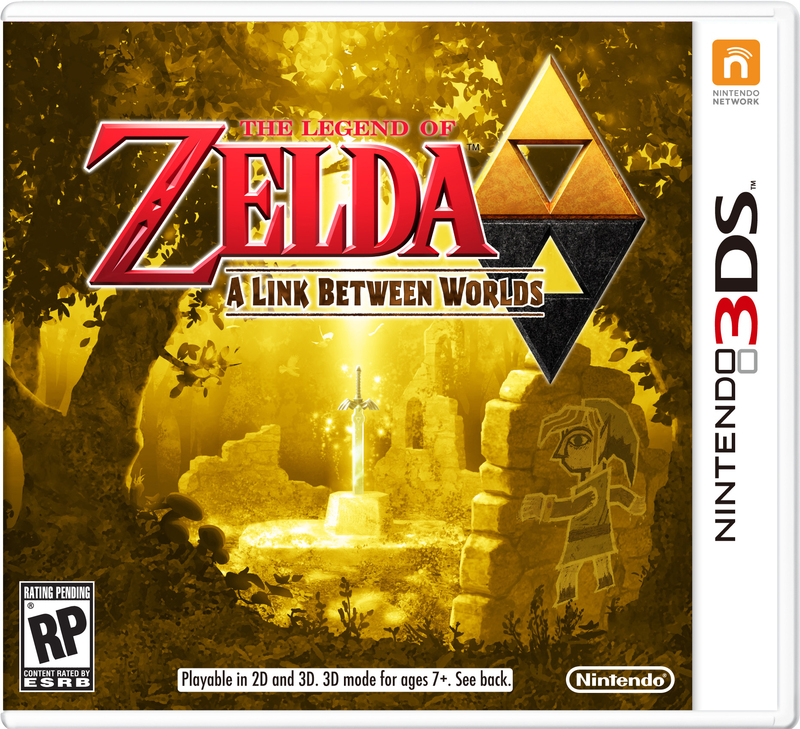 While the story of A Link Between Worlds may be lacking a bit, this game isn’t about story: it’s about gameplay and exploration, and this is what A Link Between Worlds does best. 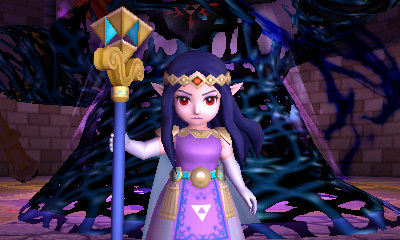 A Link Between Worlds has dared to change the Zelda formula with spectacular results. With superb dungeon design, excellent music, abundant exploration, and painstakingly difficult puzzles, A Link Between Worlds epitomizes the spirit of what The Legend of Zelda is about and has propelled the series into a new era. It is the true successor to A Link to the Past. Actualy, ALBW and Mario 3D world (and Mario party) absolutely DESTROY the games available on Xbox one and PS4. Yep, I prefer the new look, but I’m still not used to it! 3DS with the games IMO. Can’t let you do that Starfox. Go with this or the Xbox one! Personally, I would buy this first before fixing my eyes on a brand new system, but hey, both are great choices. Lol. Nintendo fans and Xboxers are going to be flooding the stores! It’s worth it. Just a fantastic game to be honest. Hero mode is very difficult too. Going to pick up this and Tearaway tonight during the GimpBox One launch. Might even bring some friends and tomatoes to toss at the Xbox degenerates. A deep game like this can wait for me to buy. I still havent finished luigis mansion and alternating between pokemon and animal crossing is so hard to do. Bringing my 3DS and WiiU to the xBoxOne launch! I can get 3 hours of WiiU play out of my portible battery, so I’ll be in line like, “Yeah, I’m rocking console gaming while you’re twiddling your fingers. XD” I’ll be cranking on Link to the Past while waiting to purchase A Link between worlds! can’t wait, it’s going to be a hellava night! But you’re not getting a turd box one, right lol? Of course you’re not, sorry I doubted you lol. Got it earlier today, one of the best frickin’ games I have played in ages! Totally making it to the Top 5 of my Zelda list. This, and from the looks of it, Mario 3D World (here in Europe, we have to wait a bit) is in my opinion much better than buying a console that will most likely not live up to the expetations. Nintendo nailed this Christmas’ line-up, I hope it does well! how did you get this today? Bought it online. They normaly send it 2 days earlier here in Norway, and if you’re lucky, you get it in one day. Like I did this time! Get excited Nintendo fans…. In a few hours the Wii U will be the second most pathetic console in the world. I LOVE all of the positive reviews this game is receiving. Makes me want it even more. But darn it, my life is so screwed up at the moment that I can’t concentrate on playing any games. I’m always worried about something. If anyone has any questions I’m here to answer. Hmmm… is it just me or does Hilda look slightly suspicious? It’s just my overactive imagination, but is this the “Your Grace” character Yuga was referring to? That actually ends up being a MAJOR spoiler so I’m sorry but I’ll have to leave it to your imagination. :) Sorry, it’s just huge and factors in with the end game. While I did say the story was a little weak, there are some twists I wasn’t expecting. This is an amazing game. I went in with low expectations and was surprised that Nintendo could still make a good zelda game after Skyward Sword. My only beef with this review is the fact you complain on how forgettable the current Zelda nemesis, Yuga, is. But does anyone recall Vaati, Demise, Ghirahim, Veran, Zant, Onox, and other plethora of adversaries in this Universe? Hardly, because whenever you think of Zelda, you always think of Ganon (aka Ganondorf) as the main heavy. Just as one thinks swiftly of Bowser in the Marioverse. Or Mother Brain/Metroid in that Universe. But does it diminish the game itself, does it really detract from the gameplay? Not at all. So far, from what I’ve played, the classic and new elements function wonderfully while retaining the reason why we played Link to the Past in the first place. The story just helps us along and experience the adventure, regardless of the characters. I didn’t think Yuga was a strong villain, but I do think Demise was a very strong villain for the series and I’d like to see his return. But there’s a reason why I didn’t factor story much into my review score. I still gave it a 9.5/10 because it’s not a game about story or villains. The boss fights are fantastic but it’s not about that. And you are correct, it doesn’t detract from the gameplay, hence the high score. Handheld Zelda games are different than console ones. I’m not expecting an earth shattering story. My only disappointment was I never felt a connection to the NPCs like in ALttP. But again, what I really cared about was the puzzles, the music, and the gameplay. And all of those were splendid. And exploration. So while I did mention bits about the story in my review, it didn’t detract from my overall experience. This is still an amazing game and I hope that aspect didn’t come off as overly negative. I even say in the review, it didn’t really bother me because this is not a game about story.